It has been my experience that when you lie or practice deception you deny a fundamental right to all those who are affected by it. This fundamental right was preprogrammed into our genome from the very beginning and has given rise to how we perceive the truth and why we hold the values and morals we do as a society and as individual people. This right I speak of, that which God freely gave to us, and which we destroy with each lie and deception is the right to justice. Every society in the world that has ever been no matter how great or trivial they where in history all had a system of dealing with justice. For it was justice the people wanted when they revolted against Rome, it was justice the people of Rome wanted in over throwing the tyrant called Caesar Nero on June 9, 68 AD. It was justice the people of Britannia wanted through self government which sparked the construction of Hadrian’s Wall by the Romans in 122 AD to deny freedom. The building of obstacles to destroy hope for justice has been an old and relentless practice for a very long time. In fact the idea of justice is what made the Jewish leaders known as the Sanhedrin seek out and create a case to execute Jesus Christ. In our modern world we dispense justice through a court who is headed by a judge who declares after hearing both sides his opinion and makes orders accordingly. But what if the judge gets it wrong? What if the judge was manipulated and deceived by a very skillful lawyer? Deception in all forms is a lie, and God does not tolerate liars. The Lord our God is truth, every word he utters is pure. It is in his heart and upon his words. Truth and justice is the very essence of God, and yet our justice system that once was founded upon the principals of the commandments of God has now turned their face from God in a prideful tirade as like a small child who thinks themselves more powerful, smarter, and better than their own parents. It is the word justice we have defiled in our own repression and destruction of the American family through mounting a brilliant defense and creating obstacles to block one parent from another and this contest does nothing more than mask the truth and deceives and defrauds our ability to raise our own children in the ammunition of the Lord. Our courts like all other courts in history hold a subset of specific belief patterns that can be discovered by careful examination of each ruling and through this research has the truth about deception been discovered. The truth begins with the idea that all courts claim jurisdiction over the land of which they rule. The rules they create are in fact obstacles to your freedoms, and thus when you go to court you are giving your freedoms away, you are submitting to a justice system which must find guilt and which will find guilt whether or not you are guilty and this is done through deception as the lawyers argue their case they present and shade the truth. Though honor bound to tell the truth, none do. 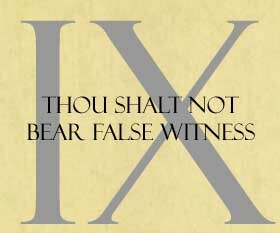 In this practice the ninth commandment is constantly destroyed in our justice system. This in turn causes mental and sometimes physical harm to the one being prosecuted, just like a warrior who has come home form battle. It is through a prideful heart filled with hatred which makes deception possible. Because of this hatred the heart spews violence against others, the words spoken into the reality of the moment is what the heart most desires. Ironically the idea of justice was supposed to protect us from these kinds of deceptions, but as Satan is all to aware that when we fill our hearts with hate we stop caring about justice, we stop caring and right and wrong, we stop caring about the affect our actions have on others, we forget about love and thus we ignore and turn from God in rebellion and we cut corners and act in a selfish manner to get what we want. Under this we defraud our entire system of justice, we destroy our entire moral code, we over write the very fabric which God himself wrote into our genome. Question: How can you tell the difference between a lie and the truth? Answer: Because when people lie what they say makes no since, it defies logic. Their lie is weaved with hints of the truth only twisted in order to give it plausibility. It always leaves lingering questions. A lie can never be told the same way twice as the facts it sites are rooted in swampy mud and is alway shifting and changing. In contrast the truth is straightforward needing no support, it is impossible to trip up because the facts are rooted in the hardest rock and is unmovable. It is not afraid to stand in the mist of many liars and thieves and shine the light of its truth for it is blessed by God. The truth is consistent in every aspect, it builds upon only the truth and cannot be suppressed. The truth transforms a person from inside out and lights a furnace within the heart so hot water evaporates before it can ever hits the flames. The truth consumes lies with a righteous vengeance as it is molded from time it’s self and will be the same today as it will be tomorrow and every day after till the end of time. Don’t forget to Flatter us with your warm .05, .10,.15,.25 cent donations by using the Flatter button found at the top right hand side of this page. God Bless. Thank you. I look forward to your many repeat visits. Thank you Justin, I certainly hope you do come back. Previous Previous post: Special Post: This is For You!